My Live Music Recording Technique: Mic Placement and Input Levels | Brad's All Vinyl Finds! There are a lot of ways to record live music, I stumbled on mine and it turns out to be a very simple way to get good sound from one mic when I’m shooting video live (and syncing the mic audio to the video in post production). I didn’t want to put a mic on a stand that would get in the way of the audience’s view. So I put my Tascam DR-07mkII on a 10 inch high tripod on the floor, a few feet in front of band and pointed it up. I didn’t think it would work very well, but to my surprise, it did. I got a natural, balanced sound (with the help of the Tascam’s built-in stereo mics, set to an X-Y pattern). Turns out there’s some real science behind why this works. I just stumbled (again) on an article called A Distant Micing Technique, from the April 1971 issue of the now defunct db Magazine*. “When the microphone is barely off the floor, excellent results were obtained,” the article stated. The results were better than putting the same mic, in the same place, on a mic stand four feet high off the ground. Which is what most of us would probably do. How come? Turns out that the sound reflected off the floor has a great effect on the sound, which tends to be hollow if the mic is on a stand, instead of barely above the floor. Per the diagram from the article, say you’re recording a guitarist live from 12 feet away. The sound arriving at your mic (on the four foot stand) also receives the guitar sound that is bouncing off the floor in between the guitar and the mic. That sound travels 14.4 feet instead of 12 and is out of phase with the “main” sound that only travels 12 feet. Combining the two at the mic means some frequencies are cancelled, and you get a hollow sound. Might sound as if you’re recording in a bit of a cave. Think of a quiet lake. Drop a pebble into the water and you get waves. But drop a second pebble at the same time but at a slightly different spot and you get two sets of waves, that sometimes tend to cancel each other out. 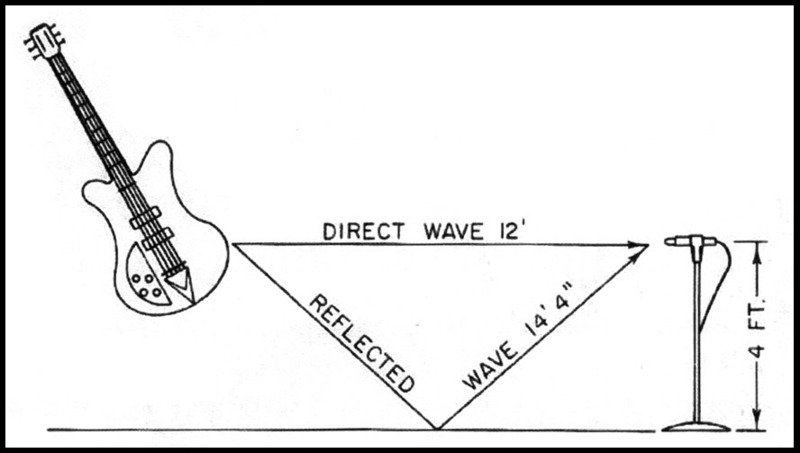 The two waves are not sync’d, they’re interfering with each other and that’s what it means to be out of phase. That’s what’s happening at the mic when two sounds, coming from the same source, are not sync’d, they arrive at different times. Some frequencies are cancelled out. Not good! Check out my Tascam, set up in between two guitarists, just a foot or so in front of them. OK, I’m not 12 feet away, but the idea is the same. I got darn good sound because I wasn’t dealing with the main and reflected sources interfering with each other. The floor the guitarists were on was concrete and would likely have reflected a fair amount of sound. The proof? Take a look and listen to the finished video of friends Ron Hetteen and Damon Parrillo, recorded live in Maui…includes the clinking of glasses and waiter’s voices, so you know I’m not getting the audio from their mixing board. What about input gain levels? I was used to the old analog world, where allowing the VU meters to redline, or go beyond the zero level was not just tolerated, but often encouraged to get the best sound. Of course, in digital this would result in grinding distortion that would ruin the recording. Still, I thought I should try to get the recording levels as close to zero without going over the line. But not according to recording engineer Barry Diament. He’s one of the very best engineers on the planet and is on the edge of digital recording technologies. His blog** is a treasure trove of useful info for recordists like myself. Diament says that virtually all A/D converters (like the one built into my Tascam) distort MORE above -6db than below….so I should record with levels peaking around -12db! Here I’d thought that I should be as close to zero as possible! This is especially true if the recording is at 24bits versus 16. OK, my recordings are at 16 bits, but what the heck. I don’t know about you, but I think it’s pretty natural sounding (yes, this is the same video from my post about the Bob Enos band…). So! If you’ve only got one mic (or a stereo pair) and are limited as to where you can place it, try in front of the band, on the floor, and keep those recording levels lower than you might expect to! ** Barry’s blog is here. Check it out!